The LALS facility has many bridges, trestles and tunnels. Photos of most of them are shown here. The largest bridge at the LALS is this truss structure at the west end. 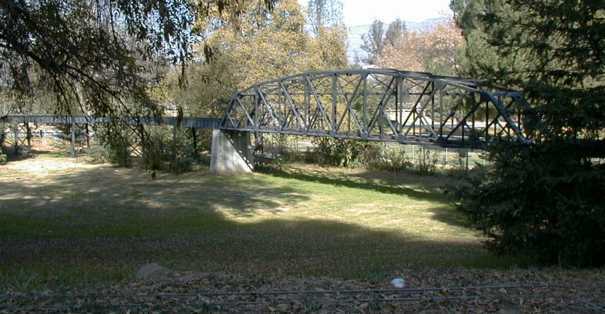 This bridge is of all steel welded construction and has walkways down its entire length, as do all LALS bridges and trestles. Another view of the large structure shows the multisection plate girder sections that complete the bridge. These sections are longer in total than the truss section. 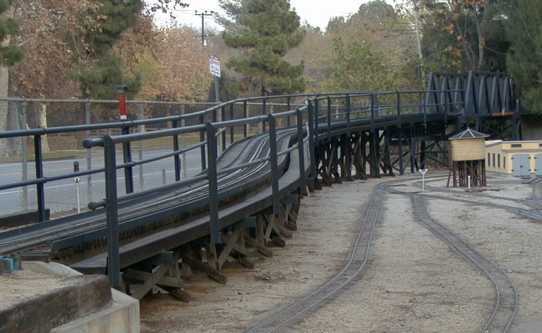 This curved wood trestle is located near the east end of the facility. 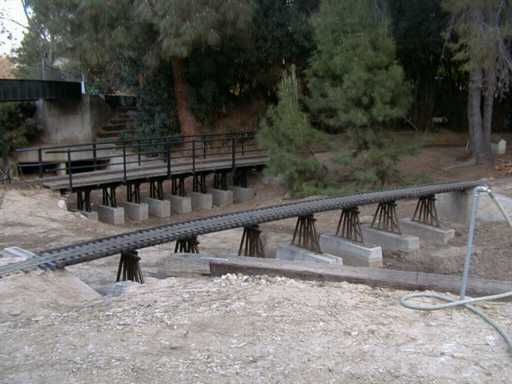 This truss and plate bridge section form the end of the long curved trestle. 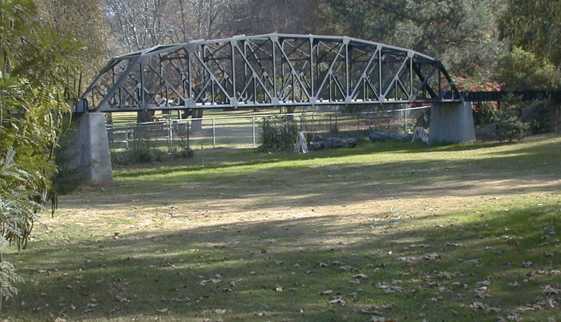 The truss bridge crosses another part of the main. The low trestle in the background is on the main approaching the bridge show above. The one in the foreground is for the 1" scale main line. 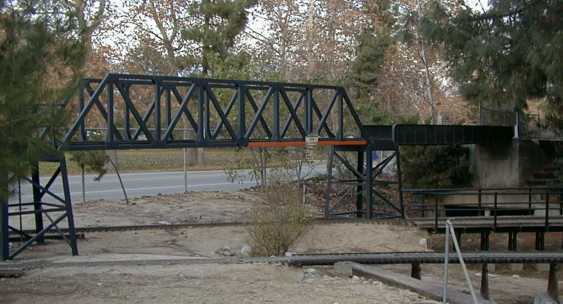 Both trestles span the main drainage channel leading out of the facility. 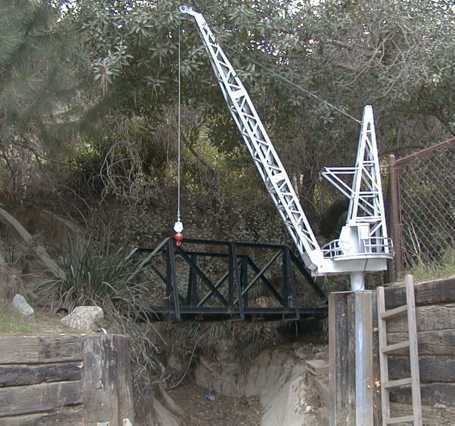 This short truss bridge spans a drainage channel leading down from the hills behind the facility. The crane in the foreground is for loading coal into a sorter installed nearby. 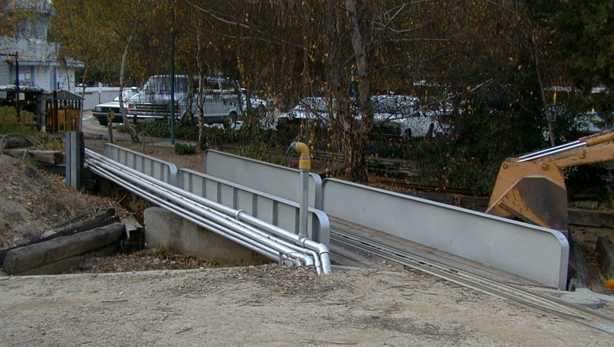 This plate girder bridge conveys the main line over the main drainage channel near the center of the facility. There are three tunnels at the LALS facility. All three are made of concrete drainage pipe and convey the track under a fire road and horse trail that separates the main facility from the "west end." The left and center ones are the traditional main line. 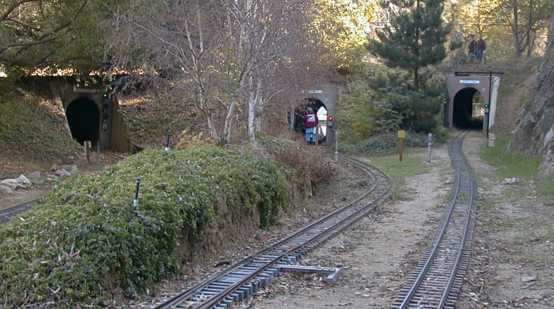 The rightmost tunnel is an alternate line which runs up the mountainside a ways. The traditional main has reduced grades and trains that are having trouble with traction can take the low road to avoid the worst grades.